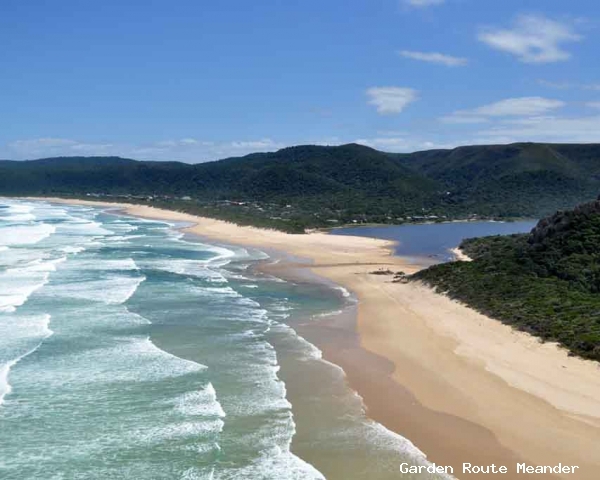 The De Vasselot section is located at the western end of the Tsitsikamma section of the Garden Route National Park (see National Parks for more information on the Garden Route National Park). It includes a coastal plateau, which rises some 300 meters above sea level, forest slopes and a section of rugged coastline. Indigenous forests account for nearly two-thirds of the 2 560-ha section of the park, while fynbos the remainder. The area is named after the Comte Mederic de Vasselot de Regne, who was appointed Superintendent of Woods and Forests of the Cape Colony in 1880. In 1974 the area was declared a forestry nature reserve and became part of the Tsitsikamma National Park in 1987. Description: Circular walk which starts opposite to the entrance to the De Vasselot campsite. The trail follows the eastern banks of the Groot River and continues along the sandy beach eastwards to the Gully. From there the trail follows the last section of the Otter Trail in reverse, ascending The Point (above the Gully) from which you will have a magnificent view of the coastline. From the gate of the promontory retrace your tracks, cross the Groot River mouth and follow the road back to the De Vasselot campsite. Features: The network of interlinking trails runs through coastal scrub forest, high indigenous forest and fynbos vegetation on the plateau. Permits: Conservation fee. No booking required for day walks. Facilities: De Vasselot campsite which is self-catering forest cabins, campsites with ablution facilities & canoes for hire.